News | Hannah Templer's COSMOKNIGHTS storm the castle starting in March! Hannah Templer's COSMOKNIGHTS storm the castle starting in March! Top Shelf Productions will publish the solo debut graphic novel by acclaimed cartoonist Hannah Templer (Jem and the Holograms, GLOW). 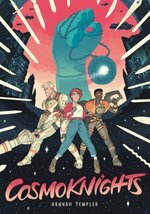 Written, drawn, and colored by Templer, Cosmoknights is a thrilling galactic adventure set in a world where mech-suited warriors duel over the daughters of the aristocracy, and a fledgling resistance of lady knights aim to bring down the system from within. Templer will serialize Cosmoknights on its own dedicated web site, www.cosmoknights.space, beginning in March 2019 (International Women's Month), leading to its print publication in Fall 2019. Many retailers are already taking online pre-orders, including Amazon, Barnes & Noble, IndieBound, Hudson Booksellers, and Penguin Random House — or you can speak to your local shop. For more on Cosmoknights, including an exclusive Q&A with Hannah Templer, visit today's article in The Hollywood Reporter! For this ragtag band of space gays, liberation means beating the patriarchy at its own game. Pan’s life used to be very small. Work in her dad’s body shop, sneak out with her friend Tara to go dancing, and watch the skies for freighter ships. It didn’t even matter that Tara was a princess… until one day it very much did matter, and Pan had to say goodbye forever. Years later, when a charismatic pair of off-world gladiators show up on her doorstep, she finds that life may not be as small as she thought. On the run and off the galactic grid, Pan discovers the astonishing secrets of her neo-medieval world… and the intoxicating possibility of burning it all down. Hannah Templer is a queer cartoonist and graphic designer. She is currently the artist on GLOW (IDW Publishing, Netflix) with writer Tini Howard, and has also worked as a colorist, cover artist and interior artist on well-known titles such as Samurai Jack, Tomb Raider, and Jem and the Holograms. She enjoys life with her trusty dog Thistle and grumpy cat Noodle, and plays tabletop roleplaying games as often as she can.